St. Mary's Church is a finalist for the 8 Wonders of Kansas because of the grandeur of its lavish ornamentation, leaded windows, statuary and murals and the fact that it is the only known G.F. Satory-painted church to be so preserved! In contrast to its rather simple exterior, the award-winning interior is aglow with colorful and detailed decoration. The church was built with nearby limestone and completed in 1894 by determined parishioners but it's what occurred starting in 1901 that has set this church apart from so many others. 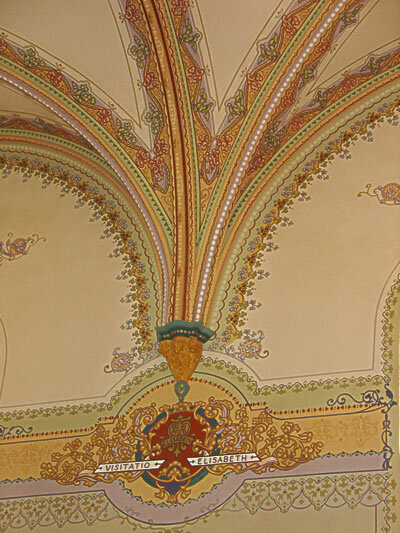 In 1901, G.F. Satory of Wabasha, Minnesota, applied beautiful colors to the walls and ceiling in the form of painted patterns, bands and friezes. He used stencils on the cast iron columns, vault ribs, and window openings. 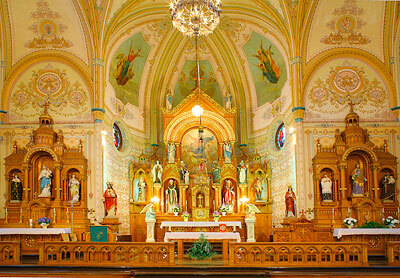 Satory was a contractor-artist of symbolic design for the beautification of churches. His style of symbolic art tolerated only the perfection demanded by the craft guilds of old. In addition, 14 large oil paintings by Russian-born artist Th. Zukotynski of Chicago, compliment the interior. Six transept windows are Bavarian-made. Eight additional side windows consist of two tall arched sections holding a rosette, all lead-glazed. Perhaps, though, the restoration of the interior was as remarkable as the original artistry. Kansans should be proud that it was Joe Oswalt, a native of Waterville, who successfully took on the challenge of restoring Satory's interior decoration and refurbishing the oil paintings (1980-1983). Oswalt, a graduate of the Kansas City Art Institute, was inspired by the degree of perfection of the original work and sought to do a job that respected the craftsmanship of the master Satory. And it was Hoefer Stained Glass of Hutchinson that restored and releaded all the windows in the church from 1991-1996. Parishioners volunteered to erect and relocate scaffolding and support both projects. The window restoration and some masonry repair was partially funded through a Kansas Heritage Trust Grant. In 1982, the Kansas Preservation Alliance recognized the interior restoration with an award and the Kansas Legislature did so with a resolution. St. Mary's Church was listed on the Kansas Register of Historic Places in 1977 and was named to the National Register of Historic Places in 1980. Location: St. Benedict is 1 mile west of Seneca on U.S. 36, 3 miles north on K-178, 1/2 mile west. Head for the church spire.